New May 2017 - New model LM431 3-channel Simflame for incandescent lamps, this model has all the features as the original 3-channel model, but adds additional switches to select Normal, Stealth or By-Pass operation as well as the ability to change the "seed" starting numbers. This model will replace the LM031, LM131 and LM231 models. Click on photos above to view videos, the videos are approx one minute in duration. the right side video is a model LM011 in each fixture, switch settings are unknown. 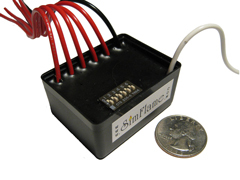 All SimFlame models use a software driven microcontroller and quality electronics to produce a simulated flame lighting effect. It creates the natural glow of candle flame, oil and gas lanterns from standard incandescent bulbs. Simflames effect is warm and subtle, lamp control is done gradually not stepped like most other flicker modules. Besure to check out the on-line videos, the videos are a full minute in duration to help demostrate the true effect and randomness, don't buy any flicker module that only shows a animated GIF, Flash or short video because you may be disappointed after your purchase. 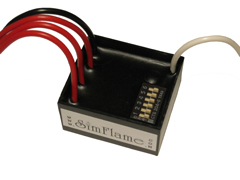 The SimFlame Plug-In model features include - NO wiring, single output, simulated flame, plug and play lamp controller. Great for tablelamps, converted oil lamps, candle stick lights, Christmas lighting, Halloween lighting, etc. Get the look and feel of candle flame without the dangers of an open flame, simply plug your lamp into the module then plug the module into any standard 110v outlet, then sit back and enjoy! The LM015 will drive incandescent and halogen lamps from 1 watt up to 100 Watts, and with 8 flicker settings finding the perfect effect to set your atmosphere is now easier than ever. Which Simflame submodel will you choose? The SimFlame Normal, this has the original operation and the biggest seller, use this model when you want your lamps to always flicker. The SimFlame Stealth, this model is normally used with a light switch and it's operation is seldom seen. When first turning on your light switch this model brings your lights to full brightness (no flicker), but when you want a different atmosphere briefly turn your light switch off then back on again and your lamps will flicker like candles! Great for that chandelier hanging over your dining room table and porch lights! The SimFlame By-Pass, this model is normally used with a light switch and the flicker effect can be cancelled. When first turning on your light switch this model flickers your lamps like candle flame, but when you turn your light switch off then back on again this model brings your lights to full brightness (no flicker). Great for wall sconces, yard lights, decks and other lighting around your home, perfect for attraction style lighting because the lighting can be brought to full brightness for safety, cleaning and maintenance of the areas where the lighting is located. Because all light bulbs are not created equal, don't settle on a certain bulb style / wattage and don't purchase all your light bulbs until you've experimented with the Simflame module, some bulbs have been reported to be "flicker proof". The modules are encased in electrically insulated fireproof epoxy making it safe to handle, switch settings can be changed while the unit is operating. 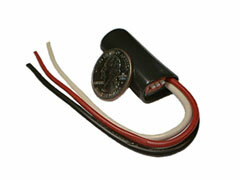 The modules can be safely installed into metal enclosures. Small enough to fit inside lamp fixtures and standard electrical boxes. The modules produce little heat and will only be warm while operating. Uses include mood, background, theme lighting and perfect for theatre, hotels, theme parks, restaurants, resorts, casinos, museums and even in your own home. Works with incandescent and halogen lamps. Each channel operates independent of the others. User configurable - 8 flame effect settings to adjust. Can be handled while operating - use caution. Low power consumption - less than 1 watt. Will not work with dimmers and some lighting controllers. Will not work with most "dusk to dawn" sensors. Can not be used with fluorescent lights, CFL's. Items may not be in stock when ordered, please email us for availability if you are under time constraints. 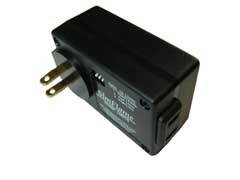 100 watts maximum load, size = 3" x 2" x 1.4"
Approx size = 4.25" x 3.5" x 3.25"